As you can see in the video here released October 30, 2013, no African American kid in a blue shirt enters immediately before Kendrick when he is coming down the hall, only the white kid with a backpack immediately before. Due to either motion sensor or time lapse, Johnson is seen below (raw video October 30) entering an empty gym at :15...then if you click between play and pause at :15 - :17 you will see the time lapse..the kid in green appears out of nowhere and KJ fades away. The rest of the kids continue in. 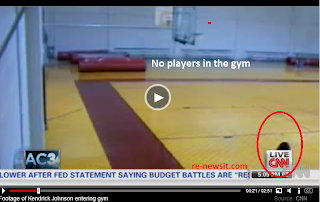 Anderson Cooper: "We see Kendrick running in at the lower right-hand side of the screen and other folks playing basketball"
Victor Blackwell walking back his initial statements about the video showing kids in the gym at the exact moment that KJ walked in. 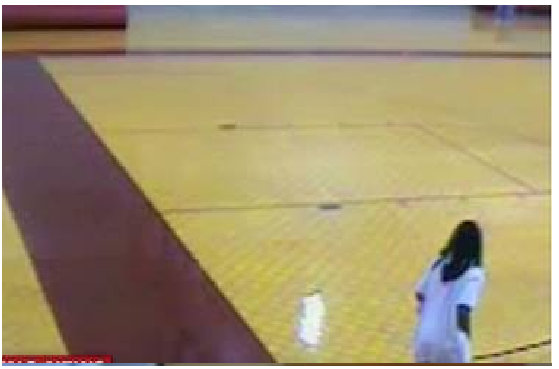 V. Blackwell: "Now, there is not time stamp on this, so we don't know how long it was between this game of basketball with the people who were there, the other students, and when he went into those mats"
Yes, the school's attorney said there were minors in the gym at the time Kendrick Johnson was in the gym - Kendrick Johnson was technically "in the gym" from 1:09 PM January 11, 2013 until late the next day. So, technically, this is correct..but these kids were NOT playing basketball, as it is depicted here, when Kendrick walked into the gym. They entered approximately 10 minutes later. This is PROOF that Victor Blackwell (and ACooper? 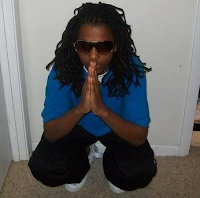 ), is part of the new "Scheme team" reporting on the Kendrick Johnson case. When you don't have a case, make something up. Victor Blackwell has been all over this case since day one. The only schemes going on started at Lowndes County High School. 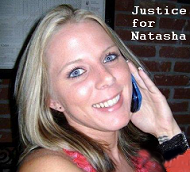 After that the huge cover up began, Involving many in Valdosta! Since CNN is in the 4th spot in news coverage ratings, they will sensationalize a story in order for viewers to watch. Early on, if you didnt know anything about this case and you only listened to CNN's version of this story, they would have had you believing that the kid was stabbed, his organs removed and then he was rolled up in a mat. It is very telling that no other news agency has covered anything on this other than to quote CNN's version. Victor drank Mr. Crumps kool-aid. On another video released, you can see the mats (mats are blurry) but you can see them and if someone would have moved the mats, unrolled the mat, rolled Kendrick back in the mat,then proceeded to place that same rolled up mat behind 20 other mats, you would have been able to see all that movement. And all of this would have taken alot of time. It took 2 people to move 20 mats in order to reach Kendrick in the very back one when rescue was called. No murder, just an accident as GBI medical examiner has concluded. his body was beat beyond recognition that surely did not come from hitting the bleachers...This was more than murder....that was overkill.... noone deserves that and even worse noone deserves to die that way without getting justice...smh people are so cruel. That young man will never receive justice all because of who his murderers know. Its so sad.